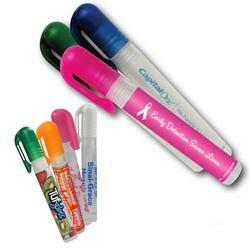 Pocket Spray Custom Hand Sanitizers in 8 ml Size, 0.25 oz, with a full color custom imprint. A great trade show giveaway, this promotional hand sanitizer will help prevent the spread of the H1N1 virus and flu. The pink cap is great as an awareness promotional gift. Contains 62% Ethyl Alcohol. Made in USA and Free Rush Available! Available Colors: Blue, Green, Orange and Pink Lids, Clear Body and Full Color Imprint. Holographic Labels available. Production Times Available: 10 Day Standard Production. Inquire for rush production. Dimensions: 8 ml or 0.25 oz. Typical Imprint Area(s): 2.125 inches x 2.875 inches. Available Imprint Options: Full Color Label. 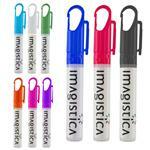 8 ml or 0.25 oz hand sanitizer pen. Rush. Made in USA.